No book review today--just an announcement that the Fourth Musketeer will soon be leaving on safari for three weeks in Africa--my first ever trip to that fascinating continent! I will be "off the grid" during that time--no e-mail or blogging. 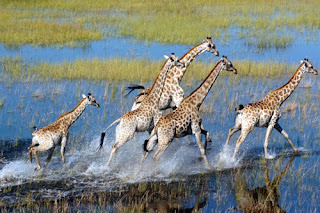 On Saturday, I am flying from Los Angeles to Johannesberg, and after a night's rest in a hotel, my college friend J. and I will be flying to Botswana, where we will be spending 10 nights in three different safari camps in the Okavango Delta, one of the world's most sought-after tourist destinations (at least according to the Botswana tourism office!). Why Botswana? OK, I admit it, I've been a serious fan of Alexander McCall Smith's Mma Ramotswe and the #1 Ladies Detective Agency since the series' inception in 1998, and have been dreaming of visiting that country ever since. 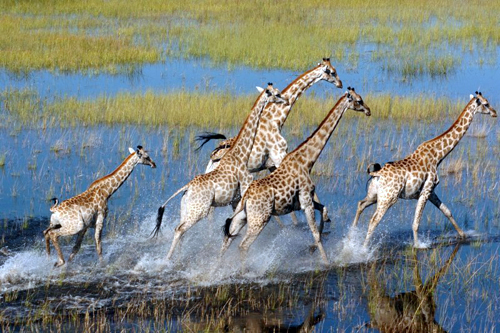 We won't be visiting Mma Ramotswe's hometown, Gabarone, but instead we will be visiting Sandibe, Okuti, and Shinde, all very small safari camps that have no more than a handful of guests at a time. From there we'll be flying to Victoria Falls, known as a sight of "awe-inspiring beauty." 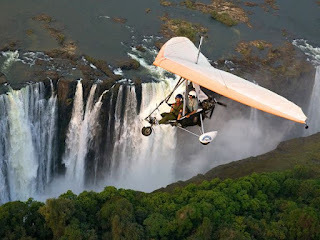 Unfortunately we will miss the moon rainbow (I had never heard of such a thing) by just a day or two but while we're there we're going on a elephant back safari and also on a microlight plane trip over the falls, among other activities. 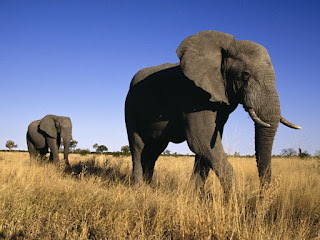 We'll be staying nearby on the banks of the Zambezi River at the Waterberry Lodge, where we'll be able to go on cruises down the river to see hippos, elephants, crocodiles, and the like. From there we'll be flying back to South Africa to spend four nights in Cape Town, which is supposed to be one of the most beautiful cities in the world. 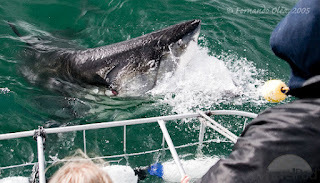 Weather permitting, we're hoping to go on a white shark cage diving excursion (I may be staying on the boat! 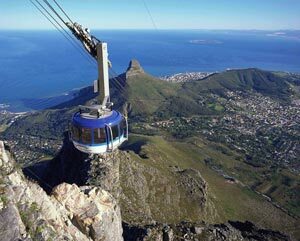 ), see the sights of Cape Town, including taking the cable car up Table Mountain, and perhaps even do some shopping! We have already booked a township tour with the Uthando nonprofit, which takes visitors on philanthropic cultural tours, visiting the projects that receive funding and other forms of assistance from Uthando and its benefactors, and a city tour with Footsteps to Freedom tour which concentrates on the cultural and historical hot spots in Cape Town. We will be staying at the lovely looking Cape Heritage Hotel. I will be travelling to Africa with two suitcases, a small carry-on which will go with me to Botswana, but, since I didn't want to waste my free check-in bag up to 50 pounds, I'll be lugging a large suitcase full of children's books to donate in Cape Town which will wait for me in storage at the South Africa airport. Through Books for Africa, I found Help2Read, a Cape Town volunteer literacy organization in which volunteers help primary school students one-to-one with their reading; they recruit, train, and support the adult volunteers and also provide boxes of fun books for the kids to read, and they are happy to take any books I bring with me. My 8-year old nephew has donated some soccer balls which will go to the Uthando charity for the township kids. And for Botswana, I will be packing some new children's underwear, pencils and erasers, which have been specifically requested by Bana Ba Letsatsi (Sunshine Children), an orphanage in nearby Maun, through the charity Pack with a Purpose. They ask travelers to developing countries to designate 5 pounds of their luggage allowance to bring items needed by community-based children's projects around the world. What a great idea! I've been lucky to do a lot of travelling in my younger single days but this is my first major trip abroad in many years--so many in fact that my new passport replaced one from 1979. Thanks to the wonderful travel agents from Expert Africa for helping to put together this trip--I look forward to blogging about it and sharing some photos when I get back! Are your tweens and teens clamoring to see the soon-to-be-released Abraham Lincoln: Vampire Hunter movie, opening on June 22? 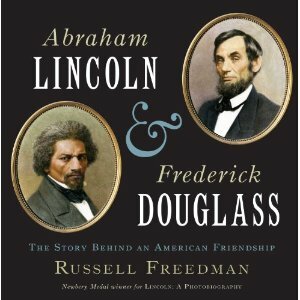 If you're hoping they'll be interested in learning something about this great American, beyond what's offered in the hilariously satirical novel on which the movie is based, you could do worse than to steer them to a new book on Lincoln and the great African-American hero Frederick Douglass by Russell Freedman. Russell Freedman is one of our best nonfiction writers for young people; an earlier biography he published on Abraham Lincoln won the Newbery award many years ago. Anyone with an interest in American history will be sure to enjoy his newest book, which comes out on June 19. It's a joint biography of Abraham Lincoln and Frederick Douglass. The book opens with Douglass waiting to see Lincoln in the White House in 1863, the only black man in a waiting area crowded with people waiting to see the president. Freedman then presents the life of stories of these two great men in alternating chapters. Toward the end of the book, their stories merge as the Civil War breaks out. They only met on a few occasions, but they had much in common, and shared a common purpose--ridding the United States of slavery. The book is abundantly illustrated with photographs, drawings, and paintings, and includes a selected bibliography, notes, and picture credits. At just over 100 pages, it's a relatively quick read, and an excellent introduction to the lives of both of these important icons in American history. With the launch of the Starz cable series, Spartacus, in 2010, and the HBO series Rome a few years back, ancient Rome is "hot" again, and it's not surprising to see a new treatment of the celebrated story of Spartacus in novel form. For those not familiar with the earlier Howard Fast novel or the 1960 Kirk Douglas film of the same name (based on the Fast novel), Spartacus is the true story of a former gladiator and slave who leads a slave revolt against the mighty Roman empire. Ben Kane, an Irish author who has written extensively about ancient Rome and is particularly enamored of military history, returns to the original sources to reimagine Spartacus' life and leadership. But as Kane admits in an afterword, there's little written by the Roman historians about Spartacus and his revolt, which held off Roman troops for an astonishing two years, perhaps because Roman historians did not take kindly to eulogizing their enemies, particularly a lowly slave who bested them in battle after battle. Of course this lack of concrete facts gives the novelist plenty of room to imagine Spartacus and the other characters in the book. The book opens with Spartacus returning to his native Thracian village after serving in the Roman army for many years. 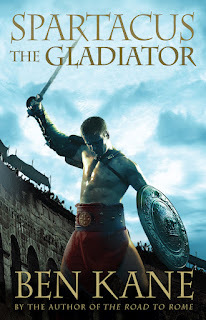 But it's not the happy homecoming he'd hoped for; after trying to overthrow the tribal king, he is betrayed and sent in captivity to be trained as a gladiator, to fight to the death for the amusement of the Roman crowds in the Colosseum. Accompanying him is Ariadne, a priestess of Dionysus, who will later become Spartacus' wife. But Spartacus won't accept his fate, and soon is planning an escape from the gladiator school, turning into a charismatic leader who soon is leading a revolt of a rag-tag group of slaves against the might of the Roman army, the greatest in the world. Will he be able to succeed in keeping the Romans at bay or will they eventually quash his revolt against their tyranny? We won't find out in this volume, since a sequel is in the works. Readers will have to wait to see how Kane completes this compelling tale. While published for an adult audience, this David vs. Goliath story is an engrossing read for teens as well, although parents should know that there is substantial violence, cursing, and sexual situations depicted. With the action-filled scenes at the gladiator school, and the battles against the Romans, it's likely to particularly appeal to teenage boys who enjoy war stories. I particularly appreciated how the author explores Spartacus' leadership ability; for example, in order to escape from the gladiator school, he must unite gladiators from different countries with different allegiances, not an easy task in the best of conditions. While there is plenty of violence, it's not gratuitous, since the violence is integral to the storyline. To sample this book, you can check out the first chapter of this novel is available at the author's website. If you are interested in winning a copy of this book for yourself or your library, please leave a comment below and include an e-mail. I will be selecting a winner at random on June 13.